Recent developments in cultural sociology have advanced our understanding of the cognitive mechanisms that link culture to action. They have also raised a significant question about whether human cognitive limits are compatible with theories that envision culture as a complex, codified social system. 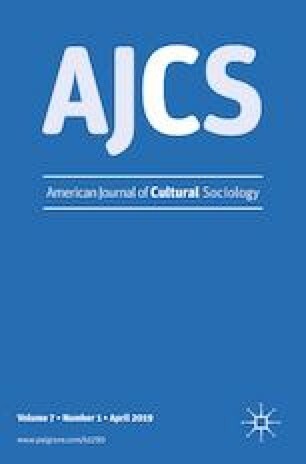 This article describes a theoretical model of culture that reconciles these approaches by focusing on the circulation of meaning through heterogeneous semiotic networks. These networks are conceived as linking cognitive and environmental locations of culture with different information processing and storage characteristics. By specifying the characteristics of these locations of culture and the semiotic mechanisms through which meaning is translated between them, the model aims to provide a theory capable of reconciling cognitive and systems concepts of culture. I presented the core idea of this article at the Advancing Cultural Sociology conference hosted by the Yale Center for Cultural Sociology in 2014. There and since I have benefited from lots of suggestions from lots of people. I especially want to thank all of the anonymous reviewers for their attention and insight. Ryan Light and Paul Lichterman provided essential advice and encouragement, for which I thank them both. Thanks also to Allison Ford for several discussions on culture, cognition, and emotion that I found very helpful in thinking through parts of the argument, and to Anne Marie Champagne for a discussion that helped clarify for me the application of the model of meaning described here to individual, cognitive, semiotic processes. Joas, Hans, and Jens Beckert. 2002. Action Theory. In Handbook of Sociological Theory, Handbooks of Sociology and Social Research, edited by J. H. Turner. Boston: Springer. Retrieved September 18, 2017 (https://link.springer.com/chapter/10.1007/0-387-36274-6_14).